A second release event will take place in Appleton at Lou’s Brew Café & Lounge on Saturday, August 11, show is at 7 pm. More articles and reviews on the Mascot Theory at Local Sounds Magazine. Recently, my family and I headed out to pick strawberries on hot, sunny day. I happened to be wearing a Mascot Theory t-shirt. After being escorted out to the field to await picking instruction, thankfully under a canopy, a jovial gentleman approached when it was our turn. He looked at the shirt and said, “The Mascot Theory. You know what my favorite Mascot Theory song is? It’s “Part Time Valentine” off the Under the Borrowed Moon album.” He then repeats some of the lyrics. “Gets me every time,” he says. When this happens to your band, you will know the level of your impact. 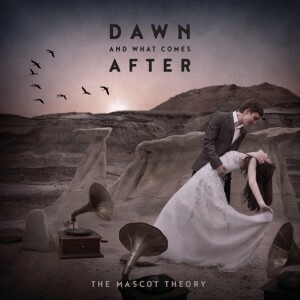 Dawn and What Comes After continues the Mascot Theory’s string of full-length releases and is the first since undergoing a significant lineup change. Lead guitarist and backup vocalist Adam White was recently replaced by Corey Mathew Hart, a respected singer/songwriter in his own right. Hart brings much to the table, his guitar tone for one. Hart’s playing is sometimes overlooked as he’s such a great singer. A bit surprising is his role on these songs, none of which bear any co-writing credits. They may have been in development when Hart came in and co-writing does seem like a logical outcome as time goes on. Though both his guitar and vocal contributions are strong, he stays largely in the background. Having Hart may be the perfect pairing for Erik Kjelland whose creativity and wordsmith seemingly know no bounds. It seems to be elevating his game; the best possible result you can have in a musical partnership. Their live show crackles with energy these days. The band’s practice of performing the material extensively before entering the studio was discarded this time around and several additional musicians were brought in to the recording process. The resulting eleven tracks are immediate and more energetic, with a wider musical palette. Horns appear on several tracks being arranged by the Lower 5th’s Jeremy Henning who plays trombone and who is joined by Phat Phunktion’s high-powered team of saxophonist Al Falaschi and trumpeter Jimmy Doherty. Wheelhouse’s Kenny Leiser is also prominent on violin. Other recognizable artists appear: vocalist Kari Arnett, cellist Brady Bachmann, keyboardist Shawndell Marks and Sam Wilson (Sons of Bill) on pedal steel. The Mascot Theory have occupied a country-rock vein but now there is a cooler, smoother edge, more real in some way as the poetry of lyrics, while not always sunny, project warmth and possibility, delivered with a collected swagger by Kjelland. There is despair in the songs but the shade always feels temporary, like a passing cloud, always blown away by sheer belief. Kjelland has a knack for matching lyrics to musical mood, a skill at which he has always been adept. A perfect example of this is “The Monster,” one of the best songs on the album and one that pushes TMT into new territory while not giving up the musical grounds already gained. The trademark Thoery sound is embellished by the horns and a four-stanza rap from Rob Dz. With Hart’s guitars electrifying the atmosphere and the vocal refrains, it all melds together seamlessly and effortlessly like, well, like a hit song. The lyrics imply the presence of a guardian angel in the form of a deceased acquaintance who keeps things together when the “monsters” of fear and doubt are lurking. But “The Monster” is the icing on the opening salvo, “Awakened,” which churns along like an upbeat Tom Petty tune. From the first note TMT’s sound is more aggressive and electric. A substantial guitar hook, a killer chorus, strong vocal harmonies, snappy rhythm section and a bridge that doesn’t even feel like it’s happening. This, too, is a hit song. “Hold On to Me” is classic Kjelland balladry, a syrupy love song with sweet guitar from Hart. The string arrangement adds dimension as do the layered background vocals. The middle section is cool, thanks to Hart’s shimmering guitar arpeggios and a modulation. “Every Chamber” (as in the heart’s chambers) bring the horns back, adding incredible punch. Another brilliant piece of songsmithing. The horn-laden refrain – and Falaschi’s sax – at the song’s end is elevating. “IV” (as in intra-veinous) mines similar territory with a finely understated guitar solo. Leiser’s violin is key, especially in the unexpected honky-tonk shift into high gear in the coda. The album’s closer “Unstick the Words” is perhaps the most remarkable in the Mascot Theory canon. Awash in keyboards, the guitars – usually up front and center – are adornments to the synths and the marching drum pattern. It swells to a climax and then drifts off like dandelion seeds. Credit due to Jake Johnson here, this is a true departure stylistically without sacrificing the trademark Kjelland vocal stamp. The song offers a glimpse into the artistic potential of the Mascot Theory, escaping the strict verse/chorus structures and the resolution – musically and lyrically – that dominate their music. Though it’s not entirely clear where The Mascot Theory and Kjelland are headed one thing is for sure: they are fully capable of writing hits and they have the chutzpa to do it. Even if it’s too slick or middle-of-the-road for some tastes there’s just no denying the skill level involved. Then there are nods at artistic development that break the mold. This is like a do-over for TMT, a new twist to their sound, giving them room to stretch and grow. The pieces could be in place now for this band to break out, but to what degree remains to be seen. There is a storehouse of artistry in Hart so it will be interesting to watch them develop from here. Dawn and What Comes After is a bit of a grab bag stylistically but has enough carrot on the stick to propel them forward. There is another storehouse of back catalog (over twenty recordings between Kjelland and TMT) to keep newer fans interested for some time; all of it consistently good. It’s not common to find a local band coming from this place of strength. This means offers are likely to come, as they do for groups of this caliber, and that’s likely to pull them toward the coast or somewhere else, but also to write another chapter in Wisconsin musical folklore.